Though the Obama administration’s commitment to admit 10,000 Syrian refugees by the end of September 2016 seemed in doubt, with fewer than 2,000 resettled during the first seven months of the fiscal year, the target was met with weeks to spare. The administration has since exceeded its goal; with three days remaining in the fiscal year, 12,391 Syrian refugees had been admitted. Despite the increased entanglement of refugee resettlement with the national security debate and amid rising opposition to resettlement by Republican governors and congressional leaders, the administration recently announced its intention to raise the overall refugee ceiling to 110,000 in fiscal year (FY) 2017. In September 2015, amid record displacement and flows of asylum seekers to Europe, President Obama pledged to admit 10,000 Syrian refugees in FY 2016. This commitment was a considerable increase from the fewer than 2,000 Syrian refugees who were admitted into the United States during the previous year. It came as part of an increase in overall refugee admissions to 85,000 for FY 2016; the ceiling had been set at 70,000 each year since FY 2013. Initially the administration faced significant hurdles in meeting its commitment to resettle 10,000 Syrians for the fiscal year ending September 30. Refugee advocates attributed the delay to lengthy security checks, applied especially to Syrians (see Box 1), and to the inefficiencies in the case processing system, including insufficient staffing. The U.S. government increased staffing at processing centers abroad and digitized part of the refugee application process, turning to a rapid-response team within the White House that uses technology to improve access to government services. As a result, and with cases that had been in the pipeline for many months reaching completion, the goal of 10,000 Syrian admissions was reached, with most entries occurring in August 2016. Looking ahead to the new fiscal year, the Obama administration notified Congress that it intends to raise the total number of refugees to be admitted to 110,000 in FY 2017. It is not yet clear how many of these places will be reserved for Syrians. Concerns over refugee resettlement largely focus on government’s ability to properly vet refugees, and whether they pose a national-security threat. The screening of potential refugee candidates increased dramatically in the early 2000s. Following 9/11, the U.S. government tightened immigration controls and further strengthened measures for vetting visitors and immigrants, in particular students and refugees. A range of post-9/11 changes to criminal statutes also affect would-be refugees. Under the PATRIOT Act, it is a crime to provide material support for terrorism. Because bars to admission include crimes committed outside the United States and crimes for which individuals were never arrested, applicants for any type of status in the United States, including refugee status, are barred if they provided any material support to terrorist groups. Today, applicants for refugee status are subject to the highest level of security checks and are not approved for travel until the results of all required intelligence and law enforcement security checks have been obtained and cleared. Applicants are first screened by the U.N. High Commissioner for Refugees (UNHCR), which interviews applicants and assesses their claims. Then, if they are accepted and designated for possible resettlement to United States, applicants are vetted by the U.S. National Counterterrorism Center, the FBI Terrorist Screening Center, and the Departments of State, Defense, and Homeland Security. Syrian refugees are subject to one additional layer of background checks. While still abroad, Syrian applicants are reviewed at DHS-U.S. Citizenship and Immigration Services (USCIS) headquarters. Certain cases are then referred to the DHS-USCIS Fraud Detection and National Security Directorate (FDNS) for additional review, which includes both open-source and classified research and is designed to inform future in-person assessments. As the number of Syrian refugees seeking protection has increased worldwide, with more than 4.8 million registered as refugees and another 6.5 million displaced within the war-torn country, so has the resistance to their admission in many countries, partly attributed to security concerns. This concern came into sharp focus in November 2015, when ISIS-inspired terrorists killed 130 people and wounded 370 in Paris. While all the known attackers were European nationals, one suicide bomber was found with a fake Syrian passport, fanning speculation that ISIS was infiltrating asylum-seeker flows into Europe. Shortly after the Paris attacks, 31 U.S. governors issued statements opposing the resettlement of Syrian refugees in their states. Despite assurances from the administration that refugee applicants are subject to the highest levels of security checks, several states initiated legal challenges to the placement of Syrians. Thus far, none of these challenges have proven successful. In separate federal lawsuits, Texas and Alabama argued that the Refugee Act of 1980 mandates consultation by the federal government with states before refugees are placed, and that such coordination has not occurred. Both states sought rulings to stop the placement of refugees in their states until the government complied. Texas limited its request to Syrian refugees and also twice sought temporary restraining orders to prevent the arrival of the refugees. Both times, a federal district court declined to halt refugee placements, finding that states cannot sue the federal government under the Refugee Act and that Texas had failed to show a substantial threat of injury. Indiana used a different approach to limit the federal government’s ability to place refugees: by restricting state-administered resettlement funds. In 2015, citing “terrorism concerns,” Indiana Governor Mike Pence, now the Republican vice presidential nominee, issued a directive to all Indiana state agencies to suspend resettlement of Syrian refugees. He also indicated that state agencies would refuse to reimburse resettlement organizations that assist such refugees, including Exodus Refugee Immigration. Exodus then sued Pence and the state, citing equal protection and civil-rights violations. A federal district court sided with Exodus in February, ruling that the order violated Title VI of the Civil Rights Act of 1964, which forbids discrimination on the basis of national origin in federally funded programs. The case remains on appeal at the Seventh U.S. Circuit Court of Appeals. At an oral argument earlier this month, two appellate judges were critical of Indiana’s rationale, suggesting another likely win for Exodus. Under U.S. refugee resettlement policy, most refugees receive resettlement assistance through state-administered programs. The federal Office of Refugee Resettlement (ORR) then reimburses states for the full costs of their assistance programs. States also have the option of withdrawing from participation, and when this occurs resettlement continues, but is managed exclusively by nonprofit organizations and funded by ORR through a program called Wilson-Fish. The Wilson-Fish program was created in 1984 as a complementary approach to state-administered resettlement programs, with the goal of addressing low employment among refugees. ORR currently funds Wilson-Fish programs in 12 states: Alabama, Alaska, Colorado, Idaho, Kentucky, Louisiana, Massachusetts, Nevada, North Dakota, South Dakota, Tennessee, and Vermont. Recently, the governors of New Jersey and Kansas took steps to withdraw their states from the refugee resettlement program. While Texas has not yet withdrawn from the program, it has threatened to do so. Despite lack of success to date in the litigation, the executive commissioner of the Texas Health and Human Services Commission recently sent a letter to ORR stating that Texas will not allow additional resettlement “without assurances from the Federal Bureau of Investigation, Department of Homeland Security, and the Director of National Intelligence that refugees do not pose a security threat to…citizens.” Texas Governor Greg Abbott has stated that if ORR does not agree to this plan before September 30, the state will formally withdraw from the program. The demand takes a page from the American SAFE Act of 2015, which passed the U.S. House but not the Senate. The bill would have required personal signoff by the Homeland Security Secretary and FBI and National Intelligence directors for refugee admissions from Syria and Iraq. Soon after the governors expressed their resistance to refugee resettlement, Republican members of Congress began introducing bills to support the governors’ positions. Since November 2015, seven bills have been introduced, each of which would empower state governments to refuse refugee resettlement. None have been enacted to date. Beyond pressing for the right of states to deny refugee resettlement, Republican lawmakers since mid-2015 have introduced more than 30 bills seeking to reduce the number of refugees entering the country or increase refugee screening procedures. Congress is in the process of setting appropriations for FY 2017, and could conceivably limit the announced Obama administration refugee increases by withholding funding. The resistance to admitting refugees comes at a time when refugee resettlement to the United States is relatively low by historical standards. While an increase to 110,000 refugees in FY 2017 would represent a nearly 30 percent increase from two years earlier, it remains far from historical highs and the frequent spikes taken to accommodate international crises (see Figure 1). In 1979, amid a mass exodus of refugees after the Vietnam War, the United States admitted more than 111,000 refugees, including in excess of 75,000 from Asia. The following year, refugee admissions nearly doubled to 207,000, including more than 160,000 from Asia. Since 1975, the United States has admitted more than 3.2 million refugees in total. Note: FY 2016 data are through September 16, 2016. Source: Refugee Processing Center, “Historical Arrivals Broken Down by Region (1975 – Present),” accessed September 20, 2016, available online. In the aftermath of the September 11 terrorist attacks, refugee admissions plummeted to approximately 27,000 in 2002. Since then, refugee admissions have slowly increased. Amid record global displacement and the massive Syrian crisis, many countries have increased refugee admissions. 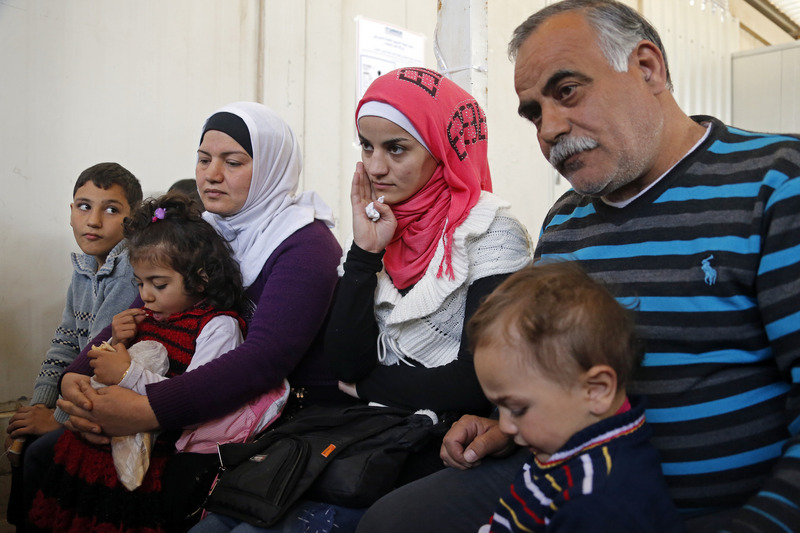 Since November 2015, Canada has admitted more than 30,000 Syrian refugees. In Europe, Germany has approved more than 174,000 asylum applications so far this year, after having registered 1.1 million asylum seekers in 2015. France has approved nearly 14,000 this year; Italy almost 17,000; and Sweden nearly 20,000. Most Syrian refugees however remain in the surrounding region. Turkey is hosting more than 2.7 million Syrians; Lebanon has in excess of 1 million and another 656,000 are in Jordan. During the final stretch of the U.S. election season, the policies surrounding Syrian refugees will certainly remain a contentious issue. The two main presidential candidates have starkly different positions on the subject. Democratic nominee Hillary Clinton has expressed support for increasing the admission of Syrian refugees to 65,000. Meanwhile, Republican nominee Donald Trump has made the potential danger posed by Syrian refugees a central theme in his campaign, likening refugees to a poisonous snake. Trump initially called for a halt to all Muslims seeking to enter the United States. He has since modified that stance to a ban on any applicants coming from a country with a history of terrorism until “extreme vetting” procedures can be put into place, including ideological tests. United States Resumes Deporting Haitians as They Arrive at Border in Large Numbers. On September 22, Homeland Security Secretary Jeh Johnson announced the resumption of removals of Haitian nationals to Haiti, a reversal of a 2011 policy enacted after the devastating earthquake in Haiti the prior year. The announcement occurs as thousands of Haitians are arriving at the southern U.S. border, with thousands of others en route. So far this fiscal year, the San Diego entry point has processed more than 5,000 Haitians—a vast increase over earlier years. U.S. officials were permitting Haitians to enter the United States pending completion of immigration proceedings, following the 2011 policy that restricted authorities from placing the Haitian arrivals in expedited removal. Now that the United States has resumed removals, Haitians arriving without a lawful basis to enter the United States will be placed in expedited removal proceedings. Audit Finds DHS Mistakenly Granted Citizenship to More than 800 Immigrants. On September 19, the Office of the Inspector General of the Department of Homeland Security reported that U.S. Citizenship and Immigration Services (USCIS) had erroneously granted U.S. citizenship to at least 858 foreign nationals who had previously been ordered deported or removed. The individuals had applied for citizenship using a fraudulent name or birthdate. Their identities were never matched with their prior orders of removal because their fingerprints were missing from the digital fingerprint repositories at the Department of Homeland Security (DHS) and the Federal Bureau of Investigation (FBI). DHS has attributed this problem to delays in the process of uploading paper-based records to electronic databases. The identity of the immigrants has not been revealed, but the report states that they are all from countries that present a national security concern or are from countries with high rates of immigration fraud. DHS has stated that officials will review every file identified as a case of possible fraud. Temporary Protected Status Redesignated and Extended for Syria. On August 1, Homeland Security Secretary Jeh Johnson announced the redesignation and extension of Temporary Protected Status (TPS) for nationals of Syria through March 31, 2018. Under the redesignation, Syrian nationals and people without nationality who last habitually resided in Syria, who have continuously resided in the United States since August 1, 2016 and have been continuously physically present in the United States since October 1, may apply for TPS until January 30, 2017. Syrians who are current TPS beneficiaries must re-register before September 30. Syria was first designated for TPS in 2012 due to its ongoing civil war. TPS was created in 1990 and provides work authorization and protection from deportation to certain nationals of countries that have been deemed unsafe for repatriation due to ongoing armed conflict, the effects of a natural disaster, or other circumstances. Twelve other countries are currently designated for TPS: Guinea, Haiti, Honduras, Liberia, Nepal, Nicaragua, Sierra Leone, Somalia, Sudan, South Sudan, Syria, and Yemen. USCIS Proposes Rule to Parole in International Entrepreneurs. In August, U.S. Citizenship and Immigration Services (USCIS) published a proposed rule to allow certain foreign-born entrepreneurs to temporarily enter the United States, to allow them to start or scale up their businesses. To qualify, entrepreneurs will need to have at least 15 percent ownership in a new start-up business and an active and central role in its operation, and the start-up needs to have substantial and demonstrated potential for rapid business growth and job creation. Qualified entrepreneurs would be granted an initial stay of up to two years, with the possibility of an extension for up to three additional years. Latin American Countries Request Change in U.S. Immigration Policy on Cubans. Foreign ministers of nine Central and South American countries joined in a letter to U.S. Secretary of State John Kerry calling for changes in U.S. immigration policy with respect to the treatment of Cuban nationals arriving in the United States. The letter comes as tens of thousands of Cuban migrants have recently been traveling through Latin America on their way to the U.S. border. Several of the countries have had to provide care to them as the Cuban migrants encounter problems along the journey. The foreign ministers blame U.S. immigration policies for encouraging the irregular migration of Cubans through their countries. Under the Cuban Adjustment Act of 1966 and the 1994 and 1995 U.S.-Cuba Migration Accords, any Cuban who reaches U.S. soil is paroled into the country and on a fast track for a green card. DOJ Provided Supreme Court Incorrect Data in Immigration Case on Denying Bail. On August 26, the Department of Justice submitted a letter to the Supreme Court admitting it provided the court with erroneous information that helped it prevail in a 2003 case. The ruling in the case, Demore v. Kim, upheld a blanket policy of denying bail to thousands of noncitizens detained while appealing removal orders. In its opinion, the court relied on government data to hold that “the very limited time of detention” faced by immigrants who appeal their removal order was too short to trigger a violation of the constitutional right to a hearing on bail. The Justice Department, in its letter to the court, acknowledged that it greatly underestimated the time certain noncitizens spend in detention without bail. New estimates put the average detention at more than one year—a significant increase over the four months originally asserted by the department. California Moves to Allow Unauthorized Immigrants to Buy Health Insurance. California officials are seeking approval from the Obama administration to allow unauthorized immigrant adults to participate in the state’s public exchange for health insurance coverage. An estimated 30 percent of the state’s 2 million unauthorized adults likely would be eligible for coverage because of this decision. Even though President Obama has repeatedly made it clear that the health insurance subsidies under the Affordable Care Act cannot go to unauthorized immigrants, the California plan takes advantage of an “innovation waiver,” which allows states to have provisions of the federal law modified, so long as no federal dollars are used. California is the first state to propose such an expansion. Lawsuit Filed Against Arizona for Denying Driver’s Licenses to Certain Immigrants. A coalition of immigrant-rights organizations has filed a lawsuit against Arizona, challenging the state’s denial of driver’s licenses to unauthorized immigrants who have been granted deferred action. In 2012, Governor Jan Brewer issued an executive order that made recipients of Deferred Action for Childhood Arrivals (DACA) ineligible for driver’s licenses. The executive order was eventually struck down by a federal judge. However, Arizona officials have now begun to deny driver’s licenses to individuals who have received deferred action outside of the DACA program, such as for humanitarian reasons. Six-Year Lawsuit against Arizona’s SB 1070 Ends in Settlement. On September 15, the state of Arizona entered into a settlement with a coalition of immigrant advocates and civil-rights organizations over the outstanding disputed parts of the state’s controversial law, SB 1070. The 2010 law included a number of provisions targeting immigrants, many of which were struck down by the U.S. Supreme Court in 2012. The outstanding provisions included the “show me your papers” clause, which required state and local police officers to inquire into the immigration status of anyone stopped or arrested if an officer has “reasonable suspicion” that the individual is an unauthorized immigrant. As part of the settlement, Arizona Attorney General Mark Brnovich filed an advisory in federal court outlining limitations on the enforcement of SB 1070, including when local and state authorities can question individuals about their immigration status. Phoenix City Council Approves ID Cards for Unauthorized Immigrants. On August 31, the Phoenix City Council voted to issue identification cards to city residents regardless of their immigration status. Unauthorized immigrants face barriers to obtaining valid government IDs. As a result, a growing number of cities have begun issuing municipal IDs. The IDs help foreign nationals access a number of services, including picking up medication or reporting a crime. Phoenix is the first Arizona city to offer an ID card that is available to unauthorized immigrants. Immigration to the United States from the Middle East and North Africa (MENA) region has increased in recent years, rising to a total population of 1.02 million in 2013. This data Spotlight delves into the variations among MENA groups on key socioeconomic indicators, from geographic distribution and language proficiency to employment, immigration pathways, and naturalization.